Multiplier is an incredibly basic fixed odds game. All you have to do is select a portion of the wheel you want to wager on and hope that the spinning marker lands within your chosen segment. Honestly, this is quite possibly the most basic game I have played on any real money games site. 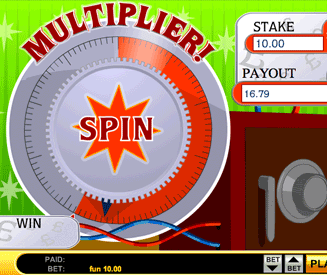 Note: Multiplier is one of those simple games that has been constructed wonderfully. It does it’s job (albeit a simple one) well. "Multiplier" is not the sort of game that you’re going to want to sit down and play for half an hour. However, it is useful if you’re looking for that quick win or two at the end of a session to recover some losses. Multiplier is so basic that I can’t give it a high fun rating. That would just be a slap in the face to the ingenious games that have obviously taken a while to develop (like Pachinko). However, just because the fun rating is low, it doesn’t mean it’s a game you should avoid. Whilst Multiplier may not be fun, it is certainly useful. There are very few games that can provide variable wins so quickly, which means that it’s the perfect game if you have a winnings target that you want to try and quickly achieve. I’m never going to log in to my online games site account just to play Multiplier, but it’s nice to have it there if I’m looking for a speedy win every now and then. Select how much you want to bet with and a segment of the wheel to wager on. Spin the marker and hope that it lands within your chosen segment. I wasn’t lying to you when I said that Multiplier is a basic game! Multiplier is all about how much or how little of the wheel you choose to wager on. The more of the wheel you select, the greater your chances of winning but the lower the payout will be. The less of the wheel you select, the lower your chances of winning but the greater the payout will be. To get the highest multiplier of 349.2x you need to select the smallest segment of the wheel possible, and vice versa for the lowest multiplier of 1.006x.